Last week I crossed the entire width of the country, leaving behind my beloved cats (and my internet connection) and travelling from snowy upstate New York to sunny San Jose. I made this same trek two years ago for the same reason: to go to Pantheacon. If you are a Pagan, going to Pantheacon is a little like going to Mecca. There are many (over a thousand, I believe, and maybe multiple thousands) Witches, Wiccans, Pagans and other cool spiritually-oriented folk who decend on the Doubletree Hotel in downtown San Jose in February for four days of workshops, rituals, parties, and socializing, all with a Pagan slant. If you like that kind of thing, you will love Pantheacon. I have a confession to make; I am not a social person. (Yes, I hear you all gasp in amazement.) I tend to be overwhelmed by crowds and over-loaded by all the psychic energy that goes with them. You will never find me at a rock concert. But thankfully, Pagan gatherings are an acception to this rule. And Pantheacon, for whatever reason, is the uber-exception. I always come away from it with more energy than I went in with. There are probably a couple of reasons for this. The first is simple: I get to meet my fans. As an author, I tend to sit and write in a vacuum (no, not an actual vacuum…that would be very difficult). Other than the occasional email or Twitter exchange, I rarely know whether or not my books are having a positive impact on those I write them for. But all that changes at Pcon. This year, I gave two workshops, one on “Crafting and Casting the Perfect Spell,” and the other on “Witchcraft on a Shoestring.” Both went really well, and I had the great pleasure of meeting a number of folks who read and enjoyed my books. I sold a bunch of the books that are already out, and signed them for people until my hand went numb—an author’s dream! And hopefully, some of the people who came to my workshops who haven’t read my books will now be curious and go take a look. As an author, there is nothing more satisfying than shaking the hand of one of your readers. But there were other highlights as well. I got to have breakfast with my wonderful editor from Llewellyn, Elysia Gallo (we were supposed to have dinner the night before, but she had problems with her flight—a lot of folks had a hard time getting in because of bad weather across the country). We caught up on personal things and also spent some time discussing the cover colors for book number five, coming out in September. I adore this woman, and we only get to meet in person at Pcon, so I was really jazzed to be able to spend time with her. One of my goals this year was to try and attend a ritual workshop. I love my group, Blue Moon Circle, and our rituals are satisfying and magical. But there is something truly wonderful about a LARGE gathering of Pagans all creating magic together, and I hoped to attend a group ritual while at the convention. I decided to go to a Brigid Healing Ritual given by Selena Fox, another major Pagan leader (she spearheaded the fight to get the armed forces to allow the pentacle to be used on gravestones at the Arlington National Cemetery). 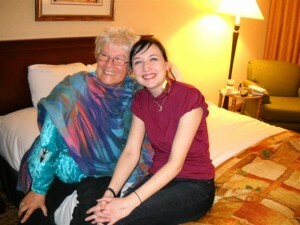 I have written articles for her CIRCLE magazine, but I’d never had the chance to meet her or see her work. I also went to an interesting workshop on the dark side of fairy tales, given by new Llewellyn author, Kenny Klein. Kenny was a great speaker, and I got some interesting ideas for possible future novels. Later, I went to the vendors room and bought a copy of his book, THROUGH THE FAERIE GLASS, which he was kind enough to sign for me. I also picked up a few gifts for the Blue Mooners at home, including an ABC Book of Shadows for pal Robin’s kids, and a few cool stones in the shapes of cats and bats and such. 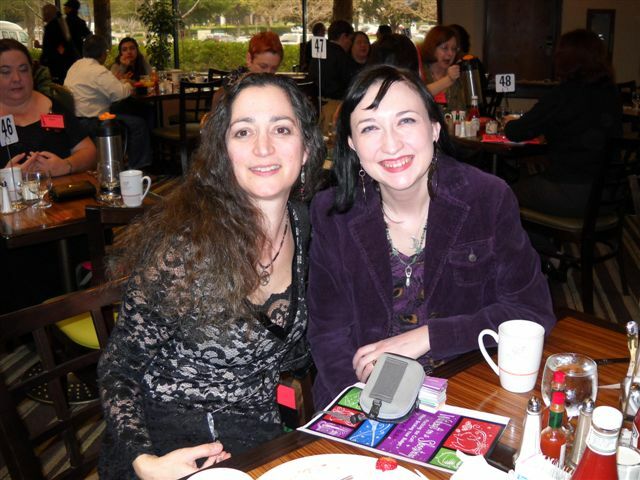 One of the greatest pleasures of Pantheacon for me is sharing the event with my step-daughter Jennifer, also a Pagan (and a member of Blue Moon Circle, although she moved to Miami 5 months ago). Jenn flew out from Florida and met me there, and we got to hang out together when we weren’t doing our separate things. As usual, she helped me with my presentations (I always refer to her as “My Entourage”) and made the entire trip easier and more fun. This year I left early to go visit with family in San Diego, so I missed some of the workshops I would have gone to, and didn’t get to meet everyone I’d hoped to. But all in all, it was a wonderful trip. I highly recommend Pantheacon to anyone who can make it there. People come from all over the country to learn and laugh and love together in the company of those who feel and believe as they do. I truly believe that it is something that every Pagan should experience at least once in his or her lifetime. And hey, maybe you’ll meet me there some year. Blessed be!